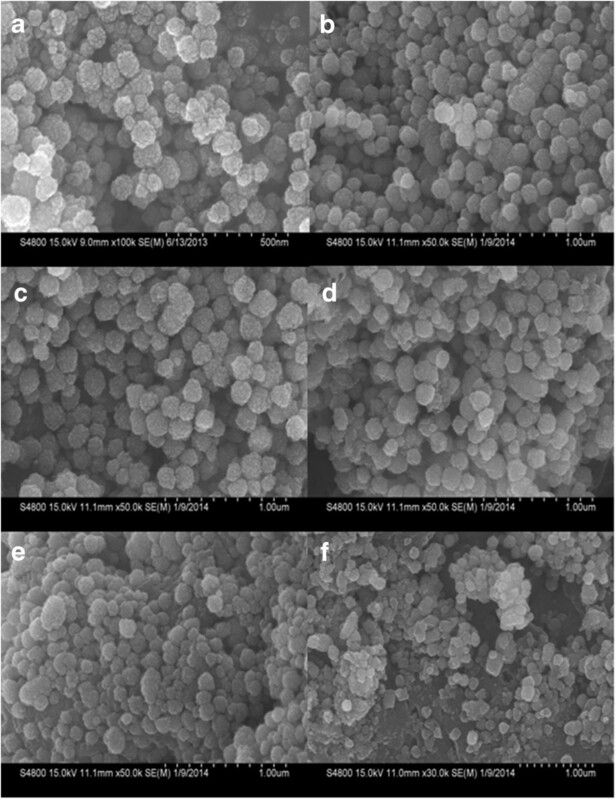 Preparation of magnetic nanoparticles coated with chitosan (CS-coated Fe3O4 NPs) in one step by the solvothermal method in the presence of different amounts of added chitosan is reported here. 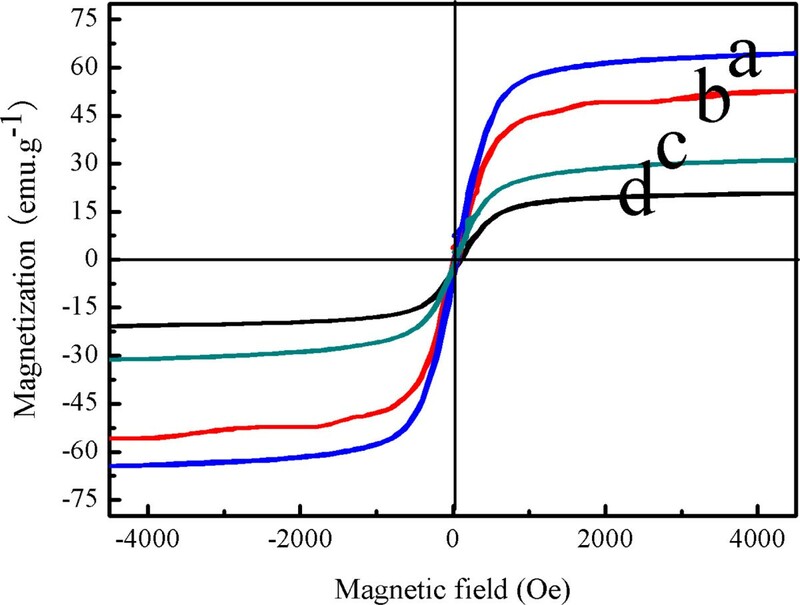 The magnetic property of the obtained magnetic composite nanoparticles was confirmed by X-ray diffraction (XRD) and magnetic measurements (VSM). Scanning electron microscopy (SEM) and transmission electron microscopy (TEM) allowed the identification of spherical nanoparticles with about 150 nm in average diameter. Characterization of the products by Fourier transform infrared spectroscopy (FTIR) demonstrated that CS-coated Fe3O4 NPs were obtained. Chitosan content in the obtained nanocomposites was estimated by thermogravimetric analysis (TGA). The adsorption properties of the CS-coated Fe3O4 NPs for bovine serum albumin (BSA) were investigated under different concentrations of BSA. Compared with naked Fe3O4 nanoparticles, the CS-coated Fe3O4 NPs showed a higher BSA adsorption capacity (96.5 mg/g) and a fast adsorption rate (45 min) in aqueous solutions. This work demonstrates that the prepared magnetic nanoparticles have promising applications in enzyme and protein immobilization. In the past several decades, magnetic nanomaterials of iron oxides (Fe3O4 NPs) have attracted much research interest due to their potential applications in magnetic storage, catalysis, electrochemistry, drug delivery, medical diagnostics, and therapeutics based on their unique magnetic, physiochemical, and optical properties [1–5]. Among the various methods for the preparation of Fe3O4 NPs, the solvothermal approach is one of great significance [6–9]. Under the solvothermal conditions, Fe3O4 NPs were usually composed of multiple single-domain magnetic nanocrystals. To date, the solvothermal method was developed for the preparation of magnetite spheres with strong magnetization through the hydrolysis and reduction of iron chloride in ethylene glycol at high temperatures. However, producing Fe3O4 NPs with specific functional groups on the surface and acceptable size distribution without particle aggregation has consistently been a problem. Thus, a variety of modifiers were added to the reaction mixtures to control the size of Fe3O4 NPs and improve the colloidal stability and biocompatibility, such as poly(acrylic acid) (PAA) , polyethyleneimine (PEI) [11, 12], polyethylene glycol (PEG) , and other biocompatible polymers [14, 15]. These modifiers are usually polymers bearing carboxylate or other charged groups. During the formation process of Fe3O4 NPs, these charged groups can coordinate with iron cations in solution, and affect the nucleation and aggregation of the nanocrystals, resulting in the formation of Fe3O4 NPs with controllable grain size and self-assembled structures. Compared with the types of polymers mentioned above, chitosan has been intensively studied as a base material for magnetic carriers because of its significant biological and chemical properties. The conventional method for preparing Fe3O4 NPs coated with chitosan is the coprecipitation method that involves obtaining the magnetic nanoparticles, followed by chitosan coating. Several research teams have tried to simplify the procedure to obtain Fe3O4 NPs coated with chitosan in one step [16–20]. 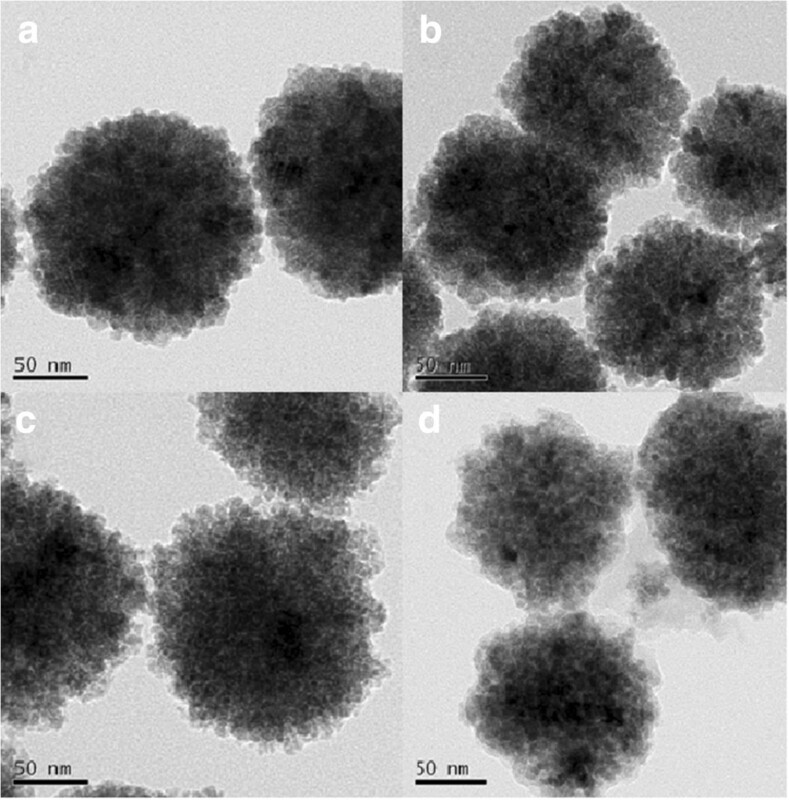 However, there are very few reports on the synthesis of magnetic nanoparticles coated with chitosan (CS-coated Fe3O4 NPs) by a one-step solvothermal process. In this paper, we report the preparation of monodispersed CS-coated Fe3O4 NPs in the presence of different amounts of added chitosan via a facile one-step solvothermal process. A detailed characterization of the products was carried out to demonstrate the feasibility of this method for obtaining CS-coated Fe3O4 NPs. Bovine serum albumin (BSA) isolation experiments were used to demonstrate the potential of the materials for adsorption. Ferric chloride hexahydrate (FeCl3 · 6H2O, >99%), anhydrous sodium acetate (NaOAc), ethylene glycol (EG), polyvinylpyrrolidone (PVP), bovine serum albumin (BSA), and chitosan (low molecular weight, Brookfield viscosity 20 cps) were purchased from Aldrich (St. Louis, MO, USA). The pure water was obtained from a Milli-Q synthesis system (Millipore, Billerica, MA, USA). Functionalized magnetite nanoparticles were synthesized via a versatile solvothermal reaction reported by Li with a slight modification . Typically, FeCl3 · 6H2O (1.50 g), chitosan (with various chitosan/Fe weight ratios: 0, 1/3, 1/2, 2/3, 5/6, 1), NaOAc (3.6 g), and PVP (1.0 g) were added to 70 mL of ethylene glycol to give a transparent solution via vigorous stirring. This mixture was then transferred to a Teflon-lined autoclave (80 mL) for treatment at 200°C for 8 h. The composite nanoparticles were denoted MFCS-0 (naked Fe3O4), MFCS-1/3, MFCS-1/2, MFCS-2/3, MFCS-5/6, and MFCS-1. The products were obtained with the help of a magnet and washed with 0.5% dilute acetic acid and demonized water. Finally, the products were collected with a magnet and dried in a vacuum oven at 60°C for further use. Transmission electron microscopy (TEM) images were obtained with a JEM-2100 transmission electron microscope (Jeol Ltd., Tokyo, Japan). X-ray diffraction (XRD) analysis was performed using a Dmax-2500 (Rigaku Corporation, Tokyo, Japan). Magnetic measurements (VSM) were studied using a vibrating sample magnetometer (Lake Shore Company, Westerville, OH, USA) at room temperature. Scanning electron microscopy (SEM) images were carried out on a Philips XL30 microscope (Amsterdam, The Netherlands). The zeta potential of these particles was measured by dynamic light scattering (DLS) with a Delsa™ NanoC Particle Size Analyzer (Beckman Coulter, Fullerton, CA, USA). Thermogravimetric analysis (TGA) of the nanocomposite and chitosan was performed in a TGA Q500 from TA Instruments (New Castle, DE, USA). Analyzed samples were heated from 100°C to 800°C at a heating rate of 10°C/min under a nitrogen flow of 50 mL/min. Fourier transform infrared spectroscopy (FTIR) of the nanocomposite and chitosan was performed by Nicolet 5700 (Thermo Nicolet, Waltham, MA, USA). The adsorption of BSA on CS-coated Fe3O4 NPs was measured using a UV-2501PC spectrometer (Shimadzu Corporation, Tokyo, Japan). 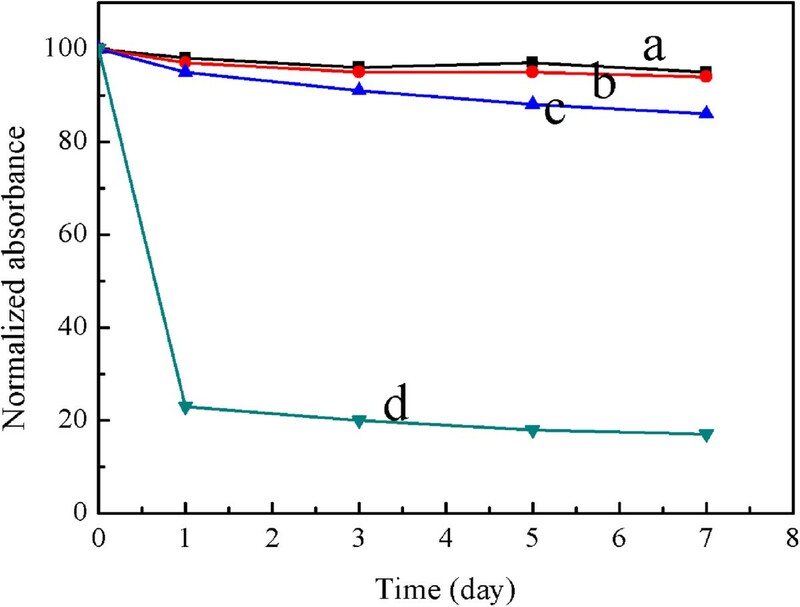 Adsorption of BSA on the CS-coated Fe3O4 NPs was carried out by mixing 10 mg of dried CS-coated Fe3O4 NPs and 10 mL of BSA solution (0.1, 0.2, 0.3, and 0.4 mg/L, pH = 6.0, 0.05 mol/L of Tris-HCl). The mixture was left in a shaker operating at 200 rpm for 10 to 240 min to reach equilibrium. After reaching adsorption equilibrium, the supernatant and the solid were separated by using a permanent magnet. BSA concentrations were measured by a UV-2501PC spectrophotometer at 595 nm. The amounts of BSA adsorbed on the magnetic adsorbents were calculated from mass balance. The standard curve of BSA is Y = 0.867X + 0.033(R2 = 0.9975). All reactions rendered a black powder at the end of the process. However, a difference between the composite nanoparticles loaded with different amounts of chitosan was visually detected. Figure 1 presents photos of Fe3O4 coated with different amounts of chitosan. As shown in Figure 1a, the suspension color changed from black to tan and then turned to black with increasing amount of chitosan. Moreover, with increasing amount of chitosan of more than 1.25 g, there were lots of nonmagnetic black powder under the bottle (Figure 1e,f), which may be caused by the oxidization and aggregation of excessive chitosan. Photos of the naked and CS-coated Fe 3 O 4 NPs obtained. (a) All MFCS. (b) MFCS-1/3. (c) MFCS-1/2. (d) MFCS-2/3. (e) MFCS-5/6. (f) MFCS-1. The functional groups of chitosan are very important for various applications, especially for biotechnological purposes. Therefore, the present functional groups should be kept even if the shape was changed into a new form; FTIR analyses were carried out. The FTIR spectra of MFCS-0, MFCS-1/3, MFCS-1/2, MFCS-2/3, and pure CS are given in Figure 2, which were exhaustively washed and magnetically recovered so that all the chitosan in the final products are chemically bound to the magnetic nanoparticles. In the spectrum of naked Fe3O4 (Figure 2a), the absorption at 586 cm−1 is assigned to the characteristic band of the Fe-O group . For pure CS (Figure 2e), a broad band at 3,410 cm−1 assigned to the O-H stretching vibration can be seen, and the C-H group is manifested through peaks 2,922 and 2,861 cm−1. Of the characteristic absorption peaks of the primary amine (-NH2), one overlaps with the -OH band at 3,410 cm−1 and the second is visible at 1,654 cm−1. 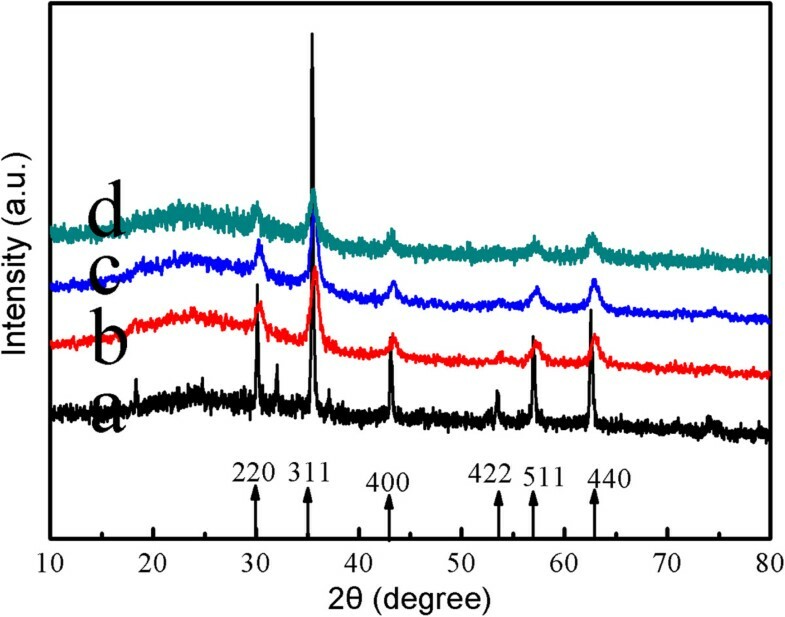 The band around 1,070 cm−1 is the stretching vibration of the C-O bond which is weaker in the spectrum of the composite nanoparticles (Figure 2b,c,d), suggesting the existence of weak chemical bonding between the Fe in Fe3O4 and the -OH group in CS . These characteristic absorption peaks for Fe3O4 and CS demonstrate that the composite nanoparticles contain both Fe3O4 and chitosan. FTIR spectra of the CS-coated Fe 3 O 4 NPs obtained. (a) MFCS-0. (b) MFCS-1/3. (c) MFCS-1/2. (d) MFCS-2/3. (e) Pure chitosan. The TGA curves of naked Fe3O4 and the magnetic composite nanoparticles are shown in Figure 3. 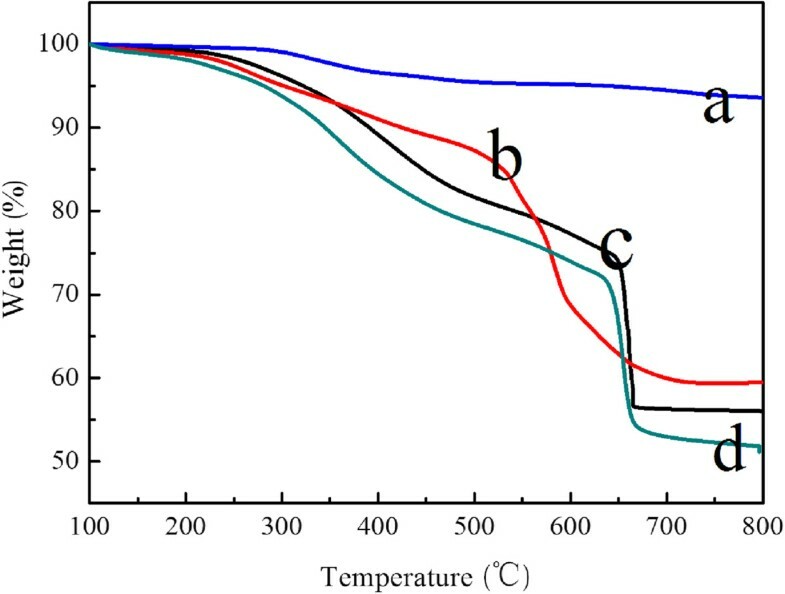 For naked Fe3O4, the TGA curve showed that the weight loss over the temperature range 100°C to 800°C was about 6.4%. This might be due to the loss of the remaining water and agents. Compared with the TGA curves of the naked Fe3O4 NPs, those of the three kinds of CS-coated Fe3O4 NPs show that the decrease of the main mass of the as-synthesized NPs occurred from about 40% to 48%, attributed to the decomposition of CS anchored on the surface of the Fe3O4 NPs. It is thus demonstrated that considerable amounts of CS were successfully coated on the surface of the Fe3O4 NPs for further modification. TGA curves of the CS-coated Fe 3 O 4 NPs obtained. (a) MFCS-0. (b) MFCS-1/3. (c) MFCS-1/2. (d) MFCS-2/3. The crystal structures of the composite magnetic nanoparticles were characterized by X-ray diffraction in Figure 4. For the naked Fe3O4 NPs as prepared in this work, six characteristic peaks (2θ = 30.08°, 35.42°, 43.08°, 53.56°, 56.98°, and 62.62°) marked by their indices ((220), (311), (400), (422), (511), and (440)) were observed . As shown in Figure 4b,c,d, these characteristic peaks can be seen in the composite magnetic nanoparticles, while the broad peak at 2θ = 17° to 27° was ascribed to chitosan, which indicated the existence of an amorphous structure . The wide-angle XRD patterns of the CS-coated Fe 3 O 4 NPs obtained. (a) MFCS-0. (b) MFCS-1/3. (c) MFCS-1/2. (d) MFCS-2/3. As seen in Figure 5, the surfaces of the spheres appear rough and composed of many small nanoparticles. 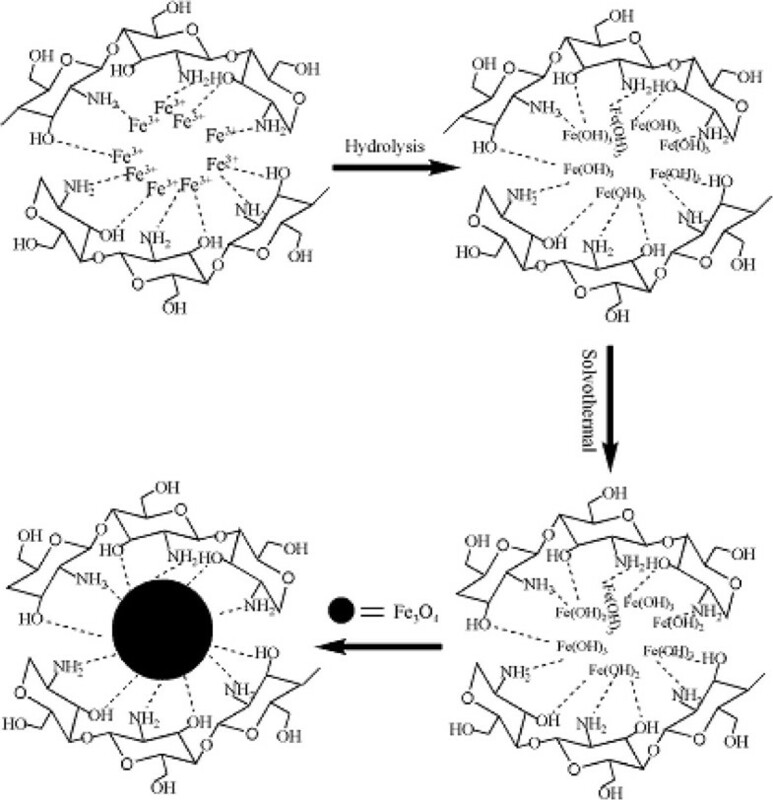 However, the spheres tend to be uniform, and the surface of the nanoparticles became smoother with increasing weight ratios of chitosan/Fe from 0 to 1/2 (Figure 5a,b,c). When the weight ratio of chitosan/Fe was from 2/3 to 1, the CS-coated Fe3O4 NPs became morphologically rough and irregular and exhibited loss of structural cohesion (Figure 5d,e,f). In Figure 6, the spheres became smaller with increasing weight ratios of chitosan/Fe from 0 to 2/3. SEM images of the CS-coated Fe 3 O 4 NPs obtained. (a) MFCS-0. (b) MFCS-1/3. (c) MFCS-1/2. (d) MFCS-2/3. (e) MFCS-5/6. (f) MFCS-1. TEM images of the CS-coated Fe 3 O 4 NPs obtained. (a) MFCS-0. (b) MFCS-1/3. (c) MFCS-1/2. (d) MFCS-2/3. The stability of the CS-coated Fe3O4 NPs in this work was studied. We chose representative water, phosphate-buffered saline (PBS) plus 10% (v/v) fetal bovine serum, PBS, and NaCl (1.0 mol/L) as media in which CS-coated Fe3O4 NPs were dispersed to systematically investigate their stability by UV-visible absorbance spectroscopy at a fixed wavelength (450 nm). If nanoparticles are not stable and sedimentate rapidly, they can be monitored by a decreased absorbance as a function of time. Figure 7 shows that the CS-coated Fe3O4 NPs dispersed in water, PBS, and PBS plus 10% (v/v) fetal bovine serum present excellent stability, whereas those dispersed in high concentration of NaCl exhibit poor stability. These results suggest that the CS-coated Fe3O4 NPs dispersed in high concentration of NaCl aggregate rapidly, which is confirmed by the DLS result, as seen in Table 1. 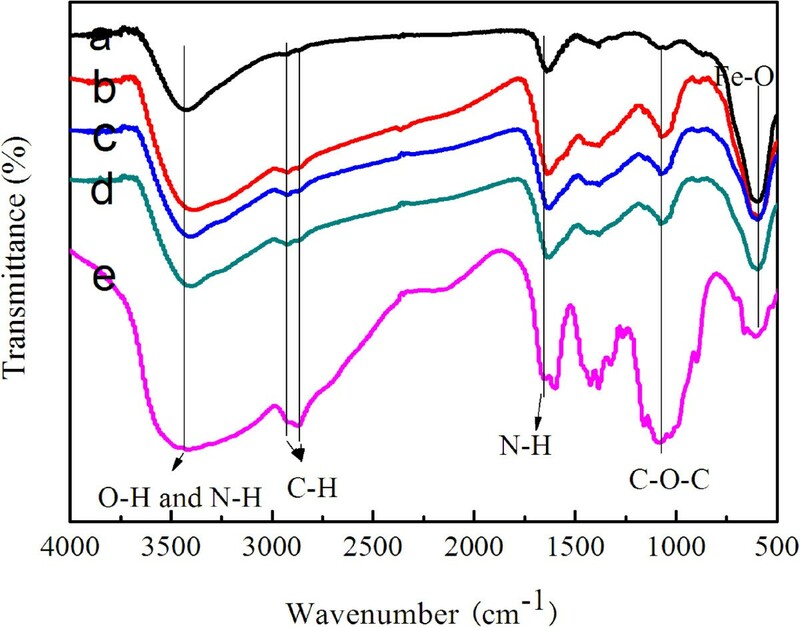 Normalized UV-Vis absorbance of CS-coated Fe 3 O 4 NPs. In (a) water, (b) PBS plus 10% (v/v) fetal bovine serum, (c) PBS, and (d) NaCl (1.0 mol/L). The electrostatic interaction of the magnetic nanoparticles can be controlled by variation in their surface charges, which can be determined by measuring the zeta potential of these particles. Compared with that of naked Fe3O4 NPs (Figure 8a), the zeta potential of MFCS-1/2 possessed a higher positive charge (Figure 8b). This may be caused by the hydrogen of the amino group (-NH2) in chitosan. Thus, this indicated that the modification with CS on Fe3O4 NPs was successful. The zeta potential of the as-prepared samples. (a) MFCS-0. (b) MFCS-1/2. The magnetic properties of the as-synthesized NPs after being coated with CS are a prerequisite for magnetic guiding application. To gain a better understanding of the magnetic properties of the as-synthesized NPs, the magnetization curves of different amounts of CS coated on the surface of the Fe3O4 NPs were measured. As shown in Figure 9, the saturation magnetization values of the CS-coated Fe3O4 NPs synthesized with chitosan: MFCS-0, MFCS-1/3, MFCS-1/2, and MFCS-2/3, were 64.2, 52.5, 30.8, and 20.5 emu g−1, respectively. This trend can likely be attributed to the higher weight fraction of chitosan. Magnetization curves measured for the CS-coated Fe 3 O 4 NPs obtained. (a) MFCS-0. (b) MFCS-1/3. (c) MFCS-1/2. (d) MFCS-2/3. In the experiment, Fe(OH)3 was formed through the hydrolysis of FeCl3 · 6H2O, then Fe(OH)2 was obtained through the reduction of Fe(OH)3 with ethylene glycol at high temperature, and finally Fe(OH)3 and the newly produced Fe(OH)2 formed a more stable Fe3O4 phase. As reported by Burke , Fe(III) ions are attached to the chitosan's surface by forming a complex compound in which Fe(III) ions act as the metal center while the ligands are the amine and -OH of chitosan. Therefore, the possible reaction describing the formation mechanism of the CS-coated Fe3O4 NPs can be expressed by Figure 10. A schematic showing the formation mechanism of the CS-coated Fe 3 O 4 NPs by the solvothermal method. In order to investigate the adsorption capabilities and adsorption rate of the CS-coated Fe3O4 NPs, 10 mg of dried CS-coated Fe3O4 NPs were added into a 10.0-mL BSA aqueous solution. As illustrated in Figure 11a, the amount of adsorbed BSA increased with elapsed immersion time. Compared with naked Fe3O4 nanoparticles (Figure 11a), the CS-coated Fe3O4 NPs showed a higher BSA adsorption capacity (96.5 mg/g) and a fast adsorption rate (45 min) in aqueous solutions. This is due to the higher initial BSA concentration that provides a higher driving force for the molecules from the solution to the amide-functionalized CS-coated Fe3O4 NPs , resulting in more collisions between BSA molecules and active sites on the CS-coated Fe3O4 composites. Adsorption quantity of BSA with initial concentrations ranging from 100 to 400 mg/L. (a) CS-coated Fe3O4 NPs. (b) Naked Fe3O4 NPs. In summary, a facile one-step solvothermal method was developed to prepare CS-coated Fe3O4 NPs with tunable magnetism, sizes, suspension stability, and surface charge. The size of the nanoparticles was about 150 nm, and chitosan made up 40% to 48.0% of the weight of the modified Fe3O4 NPs. Compared with Fe3O4 nanoparticles, the CS-coated Fe3O4 NPs showed a higher BSA adsorption capacity. This work revealed a promising method for the recovery of slaughtered animal blood by using magnetic separation technology. The authors gratefully acknowledge the support for this research from the Youth Foundation of Taizhou University under grant no. 2013QN17. MS carried out the total experiment and wrote the manuscript. WPJ participated in the data analysis. GDF supervised the project. GC, YMJ, and YJY provided the facilities and discussions related to them. WYT participated in the detection of the VSM and TEM. All authors read and approved the final manuscript.